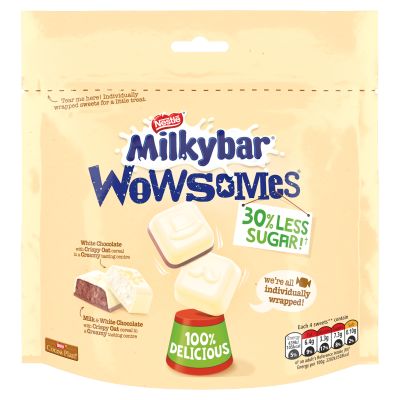 Milkybar® Wowsomes® have arrived to bring the fun - with 30% less sugar*, and 95 calories a bar! 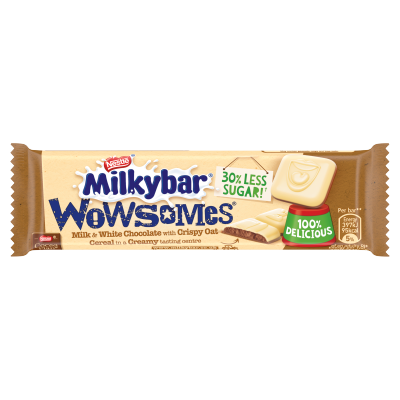 Break off a piece of our smooth three-piece bar, and say 'wow'! Each piece is deliciously milky Milkybar® white and milk chocolate, with a crispy, creamy-tasting centre that's so yummy, you won't believe it has 30% less sugar*. Using breakthrough technology, we're proud to have made a delicious bar that has 30% less sugar* with no artificial sweeteners, colours, flavours or preservatives. 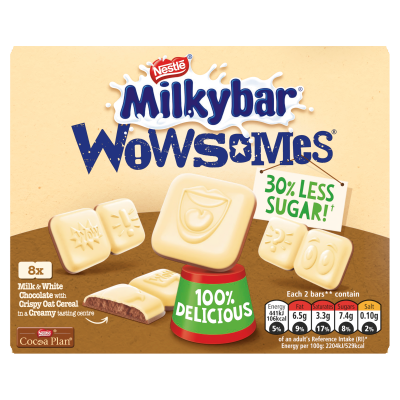 It's simply 100% delicious white and milk chocolate, filled with a creamy-tasting centre and crispy oat cereal to make a tasty little treat that's also gluten free and a source of fibre. Go on a fun adventure with each bar, as you tear open the wrapper to discover three smooth rounded squares of white and milk chocolate, each with a picture of something different! What will you get on yours? 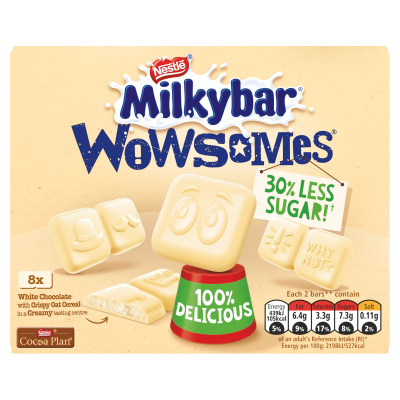 New Milkybar® Wowsomes® bring the 'wow' factor - with 30% less sugar* and 100% deliciousness. The Milkybar® brand was created in 1937, when Nestlé® almost exclusively manufactured milk products - and at Milkybar® we still love milk. 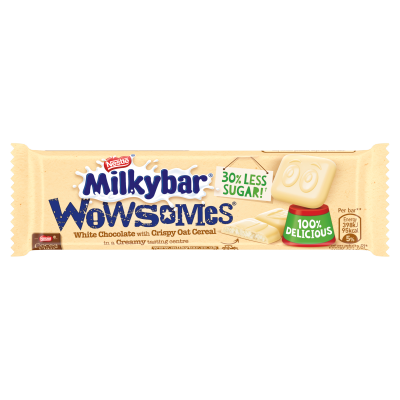 Now, with new Milkybar® Wowsomes®, milk is still the number one ingredient!